I had an email exchange the other day with my friend John Moore of Acorn Energy, a long-time energy entrepreneur and investor, who wrote to me, almost as an afterthought, "FWIW, I am seeing interest in cleantech crumble with the Indexes." "I'm beginning to think that cleantech may have to wait until my kids' generation takes over," I responded. Then John reminded me of the Gartner Hype Cycle for Technology and added, "Usually big things happen after the parade has passed." "I strive to dwell on the slope of enlightenment," I responded. Later in the week I spoke with a cleantech investor who was bemoaning the state of things. Usually an optimist, this investor said it was getting harder and harder to maintain that position. While family offices, strategics, and international investors (read China) are entering the game, from this investor's perspective, the cleantech investing scene looks pretty bleak. The funds still investing seem to be doing follow-on rounds to shore up their existing portfolios. And a number of investors have left or are leaving funds and flocking to positions at companies (or even big four accounting and advisory firms -- ahem). "But perhaps," this investor offered. "Perhaps cleantech investing will be stronger with a smaller group of dedicated people." 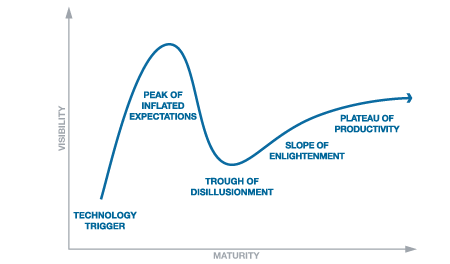 I couldn't help thinking of that Gartner Hype Cycle and especially the through of disillusionment. Perhaps that's where we are now and maybe, just maybe, we'll climb the slope of enlightenment to reach the plateau of productivity. May it happen in our lifetime.